James Slatton has done Southern Baptists a service by offering us a fascinating portrayal of one of the Southern Baptist Convention’s most notable (and notorious) leaders. W.H. 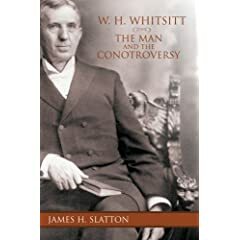 Whitsitt: The Man and the Controversy recounts the fascinating story of Whilliam Whitsitt, the third president of The Southern Baptist Theological Seminary, a leader who found himself at the center of a controversy that raged for the last two decades of the 1800’s. The Whitsitt controversy surrounded a “discovery” that Whitsitt made regarding the origins of the Baptist movement. Whitsitt wrote in an encyclopedia that Baptists “invented” immersion in the 1600’s. Of course, as a Baptist himself, Whitsitt did not intend to imply that Baptists were the first to baptize adult believers, only that they recovered the practice. But Whitsitt’s discovery came at the time when the Landmark movement was gathering steam. T.T. Eaton, B.H. Carroll and other Baptist leaders were arguing that there had been an apostolic succession of Baptist churches (and thus baptism by immersion) since the first century. Whitsitt argued that the historical documents indicate that Baptists recovered the practice and that the idea of succession could not be sustained historically. Slatton’s biography is a fascinating look at Whitsitt’s life. Whitsitt remains a pivotal figure in the history of the Southern Baptist Convention. He was the bridge between the founding generation and the second generation of Southern Seminary leadership. Slatton was given access to Whitsitt’s personal documents and his “secret” diary. Surprisingly, Whitsitt comes across as quite arrogant. He calls James P. Boyce, the first president of Southern Seminary a “dunderhead.” He goes off on people who disagree with him, and he expresses disdain for friends as well as enemies. But readers must also keep in mind that Whitsitt also talks about himself negatively. Many times, after preaching a sermon, he will dismiss his own delivery and content as sub par. He seems to be rather self-deprecating, so that his harshness with others is also reflected in his harsh treatment of himself. Most interesting is Whitsitt’s sympathy for his colleague and roomate, Crawford Howell Toy, who left the seminary because of his unorthodox views of inspiration. Whitsitt appears to agree with Toy, even though he remained at the seminary. Usually, after reading a biography, I better sympathize with the protagonist. Not so with Whitsitt. Before reading this book, I had seen Whitsitt as a good man and conservative scholar who became involved in an unfortunate controversy over Baptist history. Since Whitsitt was right on the issue of Baptist origins, I had seen him as a beleaguered hero of academic freedom. Now that I’ve read this book, I am glad that Whitsitt left the seminary. The attitude he reveals in his diary, the sympathy he confesses for a colleague who became a Unitarian, and his disdain for his Baptist brethren have caused me to lose respect for the man himself. Southern Baptists were wrong to oust Whitsitt for his views on Baptist history. But perhaps the seminary was actually better off because of his removal. “He was a complex man. At one time he predicted Baptists eventually would drop their insistence on immersion – and should. In his most important published work, however, he identified immersion as their defining practice. He agonized over the narrowness of his fellow Southern Baptists and whether he could stay with them in good conscience. Later, when the issue was joined, he took his stand as a Baptist to the bitter end – and a Southern one at that! W.H. Whitsitt: The Man and the Controversy gives us the long-overdue biography of a man at the center of a theological and denominational storm. James Slatton’s work is an unflinching portrayal of Whitsitt and his research is a gift to all Baptists who wish to learn lessons from Baptist history.